Dellaroba is walking uphill, away from the damned farm owned by her parents-in-law, to have an affair in the wettest autumn in living memory. She got pregnant in high school and married the boy, and then year later she is having inappropriate thoughts about other men. But when she gets up that hill and sees something which resemble a lake of fire above the trees, she flees back again, taking it as a sign of God. The lake of fire turns out to be a massive gathering of monarch butterflies, which when it makes the headlines, puzzle scientists and bring tourists from near and far to the small community in Appalachia. I wished this book would never end because it’s one of the best I have read this year. I love Dellaroba and her struggling family. I especially liked the conversations Dellarobia had with her best friend, Dovey, they are witty. And one of the many things that made the book so great is the humour which shines through although the conditions are very severe. 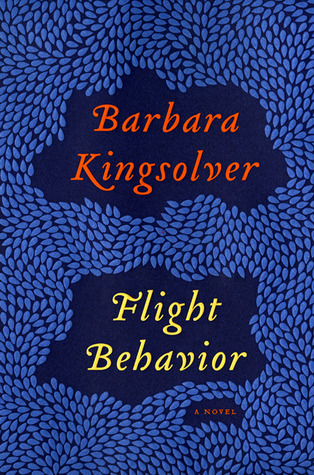 Kingsolver has done a great job mixing religion, faith and science. It’s one of those books which give you so much knowledge that you feel like a student while reading it and a professor when you are finished. I learnt as much about the Bible as about monarch butterflies, and if I hadn’t studied it, I’d have learnt a lot about climate change too. But the thing which hit me hardest was the hardships of the family. The state of their poverty and the struggle to make ends meet. It was a truly perfect read after the Casual Vacancy, both being political and works I’d classify as social realism. It is also strange to read books that are so up do date; they mention Facebook, smart phones and Wikipedia, and I can’t help wondering what people in a 100 years or more would think about our world today.